How to save the battery by GPS auto-off feature?Locus	How to save the battery by GPS auto-off feature? Smartphone battery consumption is one of the most disputed topics across user communities of all mobile platforms. Android not excluded – screens are growing, number of CPU cores is increasing, the performance is higher and faster… all this means, of course, a sacrifice of higher energy consumption. Besides the screen the biggest fuel eaters are all signal receivers – GSM, Wifi, Bluetooth, and certainly GPS. That’s why all navigation and tracking apps suffer from relatively high energy drain. If we are in the middle of civilization and we can charge our phone twice a day, usually we don’t care. When we set out to wilderness it can be a problem. Quite simple solution is connecting your device to a powerbank – some offer a really huge capacity and can charge your device even 10 times. It may happen that you are in the wild on your own and save each gram of your backpack load – then you’re looking for another solution. I don’t want to haul the power bank so what? Locus Map can significantly decrease its energy needs with the Internal GPS auto-off feature. In a principle it is a timed switching of the GPS on and off in longer intervals – normally, the GPS chip monitors position of the GPS satellites above your head and continuously calculates your location. That is recorded as a chain of trackpoints (in case the track recording is on). 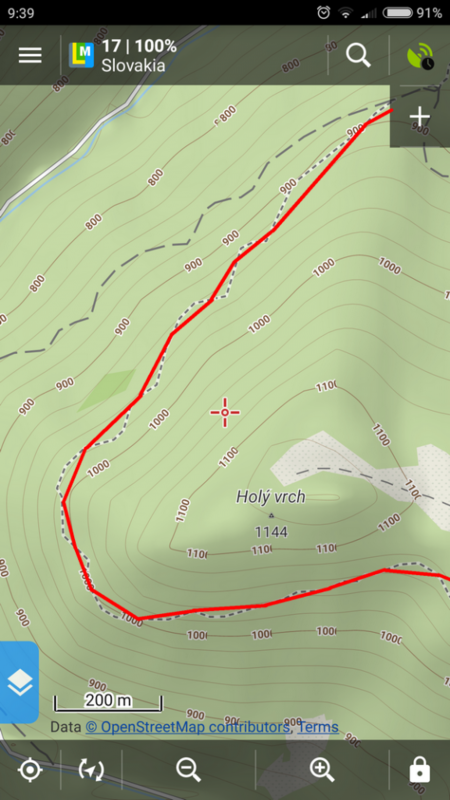 According to the recording profile setting these trackpoints can be recorded by single meters or after a few seconds of movement and the recording is quite detailed – such detail can’t even be properly displayed on some maps, not mentioning poor accuracy of GPS in rugged terrain. That often results in line full of curls and curves that we never went along. The feature of automatic switching GPS off significantly decreases number of recorded trackpoints that are recorded according to the settings by tens or hundreds of meters – GPS chip is switched on in much longer intervals and the energy is saved. A typical use case for this feature is a long-distance mountain range hike – we need to save the phone energy, weight of our load and we proceed very slowly in demanding terrain so it will do to record a trackpoint each 5 minutes. How to set GPS auto-off up? 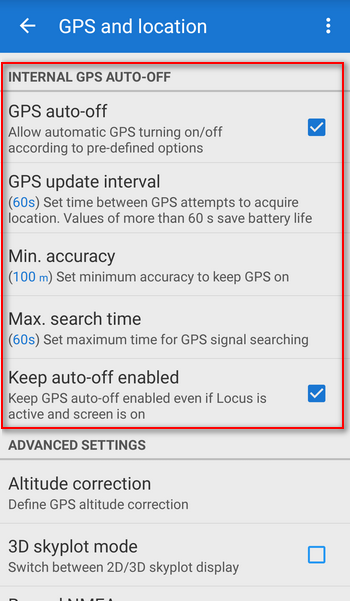 GPS update interval – tell Locus what time must pass between GPS switches/fixes. Beginning with 60 seconds you can save pretty much energy. Minimum accuracy – GPS unit progressively connects satellites and calculates your location from their signal. The more satellites it connects, the more precise is the calculation and your location. Beginning with 100 meters you can get quite acceptable results but take it as the extreme value – Locus is programmed to accept the second best location fix so finally the measurement is always better than your set value. Keep in mind your value here is always the same or smaller than the accuracy value in the recording profile settings – otherwise such a trackpoint might not be recorded. Maximum search time – this parameter is for real energy savers who don’t care much about their recording accuracy but its endurance. It defines the time in which GPS seeks for signal for your location calculation. It can take some time especially in rugged terrain – in deep ravines, canyons, dense forests or in streets lined by high-rise buildings – it may happen that Locus switches GPS off sooner than it fixes the location. Latest phones get the fix quickly but some older models can locate you a lot longer, so be aware of it. Keep auto-off enabled – GPS will be switched on/off in intervals even when the screen is on and the phone is actively used. When you uncheck this option the interval switching turns off and the GPS is on in standard way – continuously. Until you stick you phone back to your pocket. Track recording with interval GPS auto-off on. You can see the “shortcuts”. 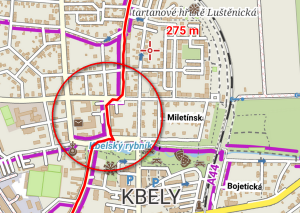 The same spot without interval GPS – the recording is much more detailed. The autumn is knocking on the door quite loudly so it’s high time to test your GPS – go ahead outdoors!